Chinese Smartphone brand Honor unveiled its latest flagship smartphone Honor View 20 in Dubai on Monday, even as the company hopes to become among the top three vendors in the region this year. Honor View 20 features a 48MP f/1.8 main camera along with a so-called “punch-hole” 25MP selfie camera with a 4.5mm diameter that is housed within the screen. Also available is an AI ultra clarity mode, an improved night mode, as well as a 3D camera for AR effects which can be used for “3D motion-controlled gaming”, body contouring in photos and videos as well as calorie counting. With a 6.4-inch LCD touchscreen, the device is powered by Huawei’s HiSilicon Kirin 980 chipset and comes with a 4,000mAh battery – which the company promises will allow the phone to operate for a full day with a single charge. Design-wide, Honor has teamed up with Italian luxury fashion house Moschino for the look, with the phone featuring a gradient rear glass panel with a “V” that appears to move with the light in different angles. The View 20 also has a dual-band GPS to allow for more accurate directions, as well as a triple Wi-Fi antenna technology for better connectivity. In the UAE, the phone is available with 8GB RAM and 256GB storage in sapphire blue, phantom blue and phantom red. Now on sale at all major retail outlets, it is priced at Dhs2,399. 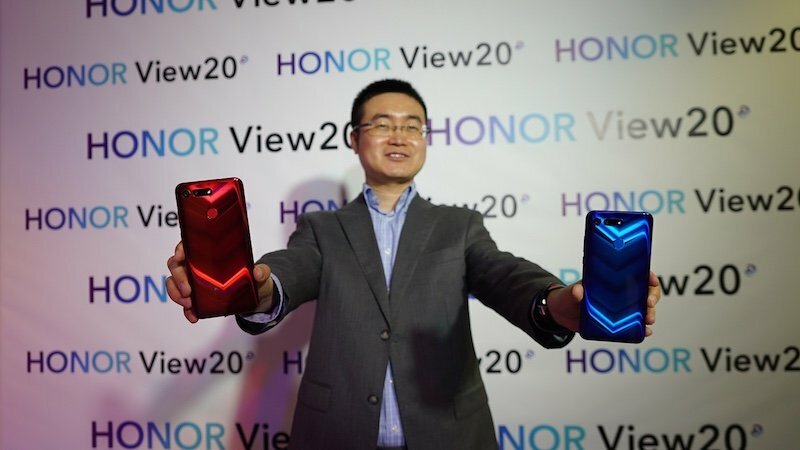 “The Honor View 20 meets every requirement for a smartphone”, said Chris Sunbaigong, president of Honor Middle East and Africa while launching the device. He confirmed that Honor emerged as the number four smartphone brand in the UAE and across the MEA region in 2018, hitting that target ahead of schedule. “In the UAE, our marketshare is close to 10 per cent. That’s a remarkable achievement for new brand – we have only been here for one year. That’s because we really care about user experience and provide quality products,” Sunbaigong told Gulf Business. The Honor View – the first from the company’s Honor series to be launched in the UAE, targets “geeks and young people”, he said. “I think the major driver for electronic devices especially smartphones, is still the technology and innovation. Once there is something that is new, unique and different – especially in the high-end smartphone range, people will go for it,” he said. Sunbaigong also dismissed competition, saying he was confident about the brand’s reputation amongst its users. After witnessing five consecutive quarters of declines, smartphone shipments to the GCC increased for the first time in the third quarter of 2018, according to International Data Corporation (IDC). The GCC’s smartphone market posted a modest growth of 1.1 per cent in Q3 to reach four million units, the report said. However, countries like the UAE continued to face declines, the report found. “The UAE mobile phone market is being hampered by an overall lack of disposable income and job security in the country, with the effects being felt across almost every sector,” said Nabila Popal, a senior research manager at IDC. However, Sunbaigong said Honor was not worried. “We believe that regardless of the market changes, people who really like pursuing the latest technology will buy new phones,” he said. Looking ahead, the brand is hoping to see a double digit marketshare in the region in a “very short period of time”. “I think the market is recovering, which is good news. Our growth will become faster and we are confident we will become one of the top three brands – maybe even within the first half of the year,” Sunbaigong added.